There are even more avenues of convergence and co-evolution that could be explored, such as symbiosis. Other types of relationships are needed for environmental changes, habitat regulation, structure building, tool usage and provision of biological services such as pollenization. The choice is to believe that all this happened by chance or that it was designed. You can turn away from evolutionary fables and find the God that created all the wonderful designs that we see in life. Intellectually, evolution just doesn't cut it. It's a very poor intellectual and a dismal spiritual replacement for the truth. Science once meant "knowledge" before the age of evolution. God's Word asks us to do science, to watch the heavens, to look at his creation, to "ask" or investigate organisms and the processes of the earth. It also asks us to prove what we believe and keep what is good. Science and belief in God's Word go hand in hand. You don't have to hide from the data or reject the obvious. But ask now the beasts, and they shall teach thee; and the fowls of the air, and they shall tell thee: Or speak to the earth, and it shall teach thee: and the fishes of the sea shall declare unto thee. Who knoweth not in all these that the hand of the LORD hath wrought this? In whose hand is the soul of every living thing, and the breath of all mankind. Generally, the assumed transitions in the evolutionary story do not require a scientific explanation. Evolution is assumed to be responsible for every feature of every organism that ever existed. The key to defining an evolutionary ancestral relationship is usually similarity of structure. The differences are assumed to be the result of evolution. Quite often however things may be very similar, but are not believed to have a direct ancestral relationship. Examples of this are fins in fish and whales or wings in bats and birds. Evolutionists dub this "parallel evolution". The basic evolutionary rule is that similarity indicates ancestral relationship except when it doesn't. In this way all the evolutionary bases are covered. Since mutations are random should we expect them to produce new useful code? Yet mutations are believed to be the source for new codes in life. Evolution requires information creating mutations to occur. This position of faith is taken in spite of the experimental and observational evidence. What might seem a convenient excuse to some, it is believed that all life altering, organ growing, system and structure producing information bearing mutations occurred before any intelligent observer ever existed. Even though a single new feature represents many coordinated mutations it is believed that new beneficial designs will arise so that natural selection can select them. 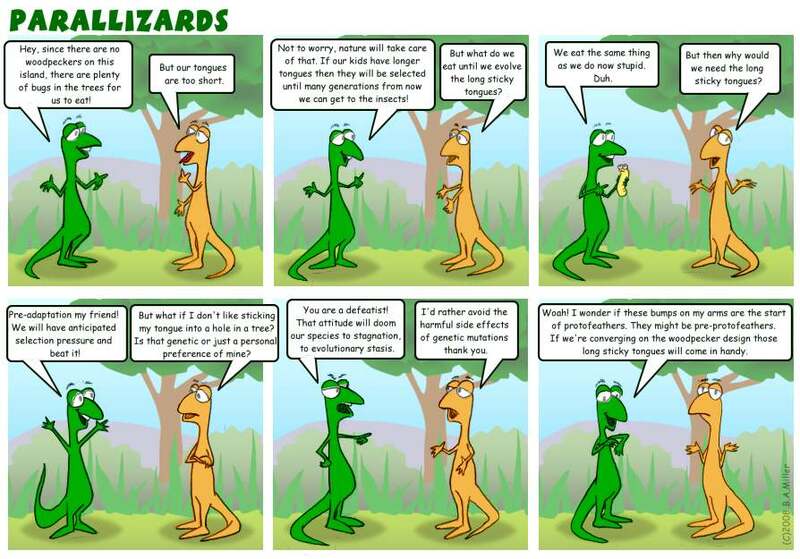 But you don't need to be a math wizard to know that a random change to existing information doesn't create new information, at least not the kind of information that would result in a positive evolutionary change. Science backs this up. Pay attention when you read evolutionary literature to see how many times they are surprised by the structures being examined or even baffled by the fact that these structures exist. The surprised and baffled reaction that happens when you look at something and you don't understand it, and or you didn't imagine it could have happened. This reaction is often followed by the phrase "isn't evolution amazing." Does the idea occur, even for a moment, that these structures might require more than just natural processes for their origin? Belief in evolution can quickly sweep this away and credulity can set in. For instance, Darwin was baffled as to how the eye could evolve, yet he developed a purely hypothetical, plausible sounding story that allowed him to believe that it could. He was able to move on no longer impeded by the need for verification. 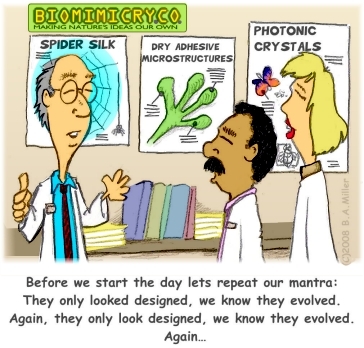 Evolutionists today, knowing much more, still cannot reconstruct the evolution of the eye using science. They have however, following in Darwin's footsteps, become very adept at creating plausible sounding tales about the evolution of almost every organism and every feature. How did flight evolve at least four times? There are several choices for the origin of wings and multiple choices for the origin of flight. The available evolutionary options offered are almost identical to those that were being offered 150 years ago. While we understand the design and mechanisms of flight many times better, the evolutionary explanations have stalled for over a century and a half. We are told that nothing in biology makes sense except in the light of evolution. No skepticism allowed. Yet, in light of our current understanding of biology, especially knowing some of the mechanics and programming at the cellular level, the evolution of any single structure in life should test the limits of credibility. Because of faith in evolution, Evolutionists are not skeptical over tales of convergent evolution, a 19th century idea that should have long ago been discarded. The assumption is that the conditions of the environment help create the convergent organisms. This idea can be maintained because evolutionists keep their focus on the credible non-evolutionary part of the process, natural selection (natural selection without mutation is not evolutionary). They assume the incredible part, the multiple, coordinated, information bearing, beneficial mutations will happen given enough time. Who can doubt that natural selection will select an organism that is suited to its environment? But mutation has never shown any promise in creating a fit organism through adding to the genome. The only alternative is intelligent design which can definitely be responsible for an organism that fits its environment. What are the odds that simultaneous, non-directed mutations (sheltered from natural selection) would cause new features to emerge and change an organism to become suited to an environment so it could then be selected? What are the odds that it would happen once? What are the odds that it would happen more than once, as in every case of convergent evolution? Science has shown us that the information in the DNA could not arise from non-directed change and there is no evidence that suggests that it could. So, while the imaginary lines drawn by evolutionists between organisms on a chart seems plausible to some, science simply does not support it. Evolution is therefore supported by circumstantial evidence and confirmed by consensus. For example we may know what sequences or what genes are responsible for building some aspects of an eye, but no one at present has a clue as to how the programming unfolds, not only to build the eye, but to connect it to the brain and load the brain with "visual basic". Skepticism should be warranted when someone, scientist or otherwise, tells you "it evolved"? Especially when they say, "it evolved more than once." From a programming standpoint DNA bases have been compared to letters and words, and the genetic sequences to programming. We can take the most basic human programming language and devise a statistical likelihood of creating an operational program by chance alone. The likelihood of a program writing itself without intelligent intervention or intention is zero. The chances of a complex program with the potential to change and thereby "improve" to create a new function without additional human intervention or intention would be zero. The likelihood of any program to degenerate if random changes are made to the code is 100%. This is only because human programming is ridged and intolerant to error. If you introduce a single error in the programming code it doesn't work. The code in life in some cases is different however, it's far more advanced. It is designed to be tolerant to a certain amount of undirected change. It has back up and repair systems. It is also designed to resist change, and correct errors. There is no evidence that it's inventive. And yet inventiveness in a code would be all the more reason to know it was intelligently designed. How do evolutionists address the problem of parallel evolution? As expected, the fact that convergence is a problem is largely ignored. Evolution is assumed to be a fact up front. This often means that no further thought or science is likely to follow. The commitment to the materialistic paradigm means it doesn't cross their mind that it might be a real problem for features to evolve more than once. Those who did recognize that there was a problem had two basic defenses. One is the "theological perspective" presenting the idea that God wouldn't have made "parallel creations." The second was to reiterate the unscientific idea that mutations create the new features that are then shaped by natural selection because of the environment. This view uncritically assumes that mutation supplies the features that natural selection will act on. Does science really lead us to the inevitable conclusion that complex living systems are bound to reoccur without an intelligent cause? Before listing some of the many evolutionary relationship problems let's look at words and phrases used very freely by evolutionists to avoid dealing with evolutionary anomalies. Parallel Evolution: This is said to occur when similarity in structure or behavior is said to have evolved in two or more organisms that have no direct common ancestor. An example would be wings developing from forelimbs of dinosaurs and wings developing from the forelimbs of rodents. This particular type of similarity is called convergence, which is explained below. Convergent evolution: When similarity in structure and or behavior is believed to have taken the same evolutionary path in two unrelated lines. The path is determined by "selective pressures" from the environment. That is, unguided mutations that knew nothing of the environment tailored the organism to the needs dictated by the "selective pressure" of the environment. More simply put: they evolved certain features because they needed to. Convergence, according to evolutionists, has been confirmed by DNA analysis. DNA shows that convergent organisms believed to be unrelated are in actuality genetically unrelated. But once again this simply assumes what needs to be proved. You still have to believe the unscientific idea that mutation created new useful genetic information and that it did it more than once. Is it good science that is supporting this kind of circular reasoning? However, now it has been found where DNA sequences have indeed arisen more than once in non-related organisms such as prestin in bats and dolphins. Here is a paraphrase of the typical evolutionist reaction to this discovery "Well I'll be, identical sequences can occur more than once, this proves that it's the environment." According to some evolutionists ducks and otters evolved web feet because they spend lots of time in the water. Can we assume that possibly given another 100 million years that ducks and otters may have fins because of their behavior in the water? If we exposed house cats to watery environments for 50 million years would they turn into whale-like creatures and give live births to kittens under the sea? That's what evolutionists say happened to the Pakicetus, the believed ancestor of the modern day whale. The Pakicetus was definitely a land animal, which may have looked like a cross between a wolf and a rat. Even though it is believe to be a land mammal and didn't even breath through the top of its head in an apparent act of desperation it's often classified with whales. The idea that environment would guide the mutations in any organism is false. Yet natural selection needs the design first. Mutation is undirected, and it has no consciousness of an organism's environment. Here is an idea that makes more sense: the reason an organism is adapted to its environment is because it was intelligently designed for it. Co-Evolution: Once again the lucky mutation changes an organism so it is suited to another organism in such a way that both must now change together in order to survive. Organisms or the environment don't trigger a genetic change in another organism, but the genetic change is needed before selection can start its selecting. Some examples of co-evolution would be bees and flowers, humming birds and flowers or predator-prey defenses (often referred to as the evolutionary arms race). Organisms do not exert any "selective pressure" on the DNA of unrelated species. In order to be selected DNA has to change first then be tested in an active organism. It is obvious that the more useful one species is to another that it would continue to be selected. But mutations would have to accidentally change one organism to work specifically with another organism before it would be selected. So far this lacks scientific verification. The fact that these relationships occur many times should worry the devoted evolutionist. The fact that all organisms are designed to work not only with other organisms but also the environment is evidence for intelligent design. Mimicry: This is a form of co-evolution where one organism mutates to look and or behave like another totally different organism. It then benefits in some way from that relationship. Examples would include insects that look like sticks or leaves, spiders that look like ants and good tasting butterflies that look like the bitter ones. Selective pressure would certainly help to maintain this relationship, but the idea that unlikely mutations could stumble on these types of solutions has yet to be tested or verified. Mimicry is actually another testimony to intelligent design. Evolutionary Stasis: also known as evolutionary conservation. This is a fancy way of saying that a structure, feature or even a whole organism hasn't evolved at all from the earliest known forms. The important thing that you are supposed to believe is that it hasn't evolved within the context of evolution. Whether an organism changes or not, evolution is believed to have taken place. So when nothing happens in biology, its still evolution. Not surprisingly, evolutionary stasis has been verified. The modern forms are the same as the fossilized forms. This leaves nothing for the evolutionists to imagine, but more for them to wonder about. When you consider the multitudes of imagined unlikely system producing changes then add cases of parallel evolution, convergent evolution, co-evolution and mimicry, and confirmed long term evolutionary stasis (non-change), does this create even a tinge of skepticism about the evolutionary scenario? Each supposed case of convergence should be another bit of evidence that falsifies evolution. Think of how many features on the human body are said to have evolved more than once. None of these evolutionary processes have ever been observed. That is, all the evolutionary changes that created parallel evolution, convergent evolution, co-evolution and mimicry are believed to have occurred in the distant past. Since macro-evolution occurs slowly, we will not be able to scientifically verify any of these, through observation, for another million years or so. That's provided that they are looking at the right organism, since some don't change at all. Just believe. Here is another question. How do you confirm that a feature is the result of convergence? What if an organism looks similar because it really is related? Or what if an organism looks different, but it is related? Does the relationship have more to do with what a scientist is willing to believe or what nature is actually capable of accomplishing? The rest of this page is a list of organisms, structures, behaviors and processes that evolutionists have imagined to be the result of parallel, convergent, co-evolution or evolutionary stasis. Evolutionists insist we believe each of the things in the list evolved two, three, four or more times. Is it intellectually sound to accept these unlikely occurrences? Those committed to evolution accept them on faith, not because of science. Below is a list of just some of the designs, processes, plans and systems that evolutionists believe nature invented more than once. A complete list would take up several volumes. A single case of convergent or parallel evolution might not in itself be enough to falsify evolution. But we have a vast number of occurrences said to be found in nature. Each of the following falsifies evolution by an exponential increase in improbability. This may seem like an exhaustive list, but it's just an overview. 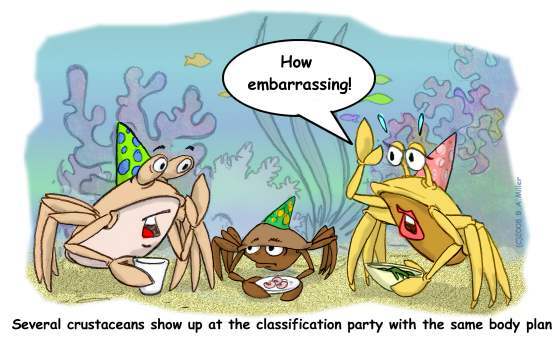 ● Crabs are believed to have evolved at least 5 times based on gene sequences. ● Rodent body plan: Some scientists believe that rodents evolved twice. Others who think the idea is not credible believe that the rodents took a raft across the ocean. Possibly they found fossilized rodent rafts? 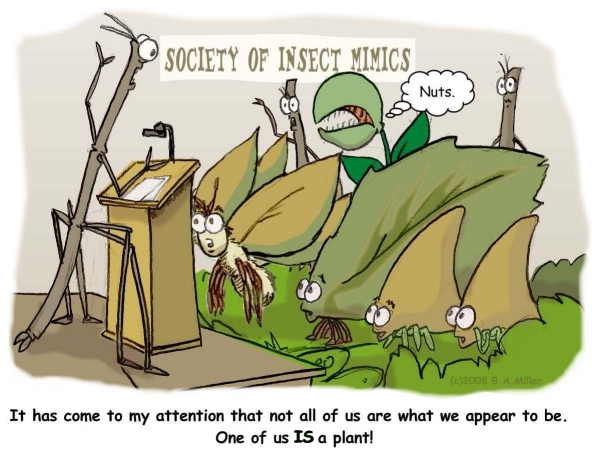 ● Insects are believed to have evolved the "six leg" plan in more than one independent group. This was determined from an examination of mitochondrial DNA in insects. ● Whale body plan: The Mosasaur is an extinct reptile that was adapted to aquatic life and whales are mammals that similarly adapted to aquatic life. ● Vulture body plan: New World vultures and Old world vultures not considered closely related. Does listing reasons why the vulture's look and behavior fits its environment explain the supposed genetic fortune that created it twice? ● Pigs are believed to have evolved in Africa and Europe, while the Peccary is believed to have evolved in the Americas. ● Porpoise body plan: Ichthyosaurs were aquatic reptiles, and porpoises as most of us know are aquatic mammals. Not only is their similarity striking, but the fact that they supposedly came from fish that evolved into land dwellers that evolved back to a fishlike form is also hard to fathom. ● Crocodile body plan: Crocodiles are an example of 200 million years of assumed evolutionary stasis. They are not related directly to their look-alikes, the Phytosauria or the Choristodera. Three excellent examples of the convergent evolution crock. ● Flying Squirrel body plan: These squirrels don't fly, they glide. But given a couple more million years could they be flying? They're certainly in the right environment. Why hasn't it happened yet? The tree down theory seems to fit best for their future evolution. The flying phalangers are marsupials that look like a mammalian squirrel. Mantis body plan: In Mantids and in independently in neuropteran insects Mantispidae. Bobcat and the Marsupial Tasmanian "Tiger Cat"
Convergence is not just something that is seen at the level of whole organisms, but evolutionists also believe it has occurred at the system, organ structural and even the genetic levels. A lucky series of mutations in the right environment is all you need. Here are a few examples of convergence that are believed to have occurred at the structural level of organisms. ● MULTICELLULARITY: The move from single cell to multi cell is believed to have arisen in algae, plants, fungi and animals. ● VASCULAR TISSUE: Vascular structures, the means for transporting water and nutrients is said to have evolved in both plants and animals. ● SEGMENTATION: Tradition holds that it evolved in both arthropods and vertebrates. ● OPEN CIRCULATORY SYSTEMS: where the heart pumps fluid into cavities that surround the organs. This supposedly evolved in arthropods and mollusks. ● SLIME MOLDS and FUNGI: have similar structures (filaments) and lifestyles supposedly brought about by the niche they occupy. ● HINGED JAWS: The hinged jaw that is often used to help you in imagining evolution in vertebrates is also said to have evolved in arthropods. ● ENDOTHERMY: Using the metabolism to maintain a constant body temperature is believed to have arisen in mammals, birds and insects. There are four basic strategies that life uses for getting oxygen to the cells. These are gills, trachea, lungs and book lungs. Evolutionists believe that all these strategies developed independently because they were needed. They also believe that multiple instances of those strategies developed independently. GILLS: Gills are used to extract oxygen from water. These are believed to have evolved many times. Each of the organisms listed below uses a completely unique version of gills. This means that genetic mutations stumbled on multiple solutions to a very difficult problem essential to the survival of the organism. some insect larva that include mayfly, buffalo fly, damselfly. TRACHEAL SYSTEM: This is the method insects use to breathe, which has recently discovered to be more than just a passive system. It is believed to have evolved many different times in insects because insects need to breathe. LUNGS: Lungs in vertebrates were believed to have evolved from swim bladders in fish and not from the breathing system already available. This is a pretty amazing transformation to change a flotation regulator to the main oxygen transfer organ. Lungs have also diverged and become specialized, such as the avian lung. Lungs also are believed to have arisen in snails. LEGS AND ARMS: Legs and arms may seem rather simple, just a thing sticking out the side of a body used for support and mobility. Legs are believed to have evolved several times in insects alone, but also in amphibians. Take a look at your arm; evolutionists believe it's just a modified fin. Given enough time things like that just happen, so they say. That modified fin is believed to have developed to support and give mobility to hundreds of thousands of different forms of organisms, from frogs to horses. FINS: Fins are believed to have occurred in fish, then after they supposedly evolved into legs they are said to have evolved back into fins again in reptiles and mammals. In reptiles this is believed to have happened several times in groups that include the Plesiosaurs and also turtles. In mammals, fins have developed in whales, in seals (which are believed to have arisen from a bear-like animal), and in sea cows (manatees and dugongs). In the penguin the evolutionary ancestry of its appendage has taken it from fin to leg to arm to wing to fin. Technically their fins are still wings being used as fins, but just give it a little more geologic time. How many different ways have been designed to help life get around? The designs include, the bacterial flagellum, legs, wings, fins and many other specialized structures. Surprisingly even some seeds crawl! Within these various categories there are also several solutions. Some so amazing that it defies logic to believe that they could occur without intelligence. WINGS: These amazing structures are believed to have developed in insects, dinosaurs, reptiles, birds and in mammals. The bodies of reptiles supposedly transformed into the Pterosaurs. The arms of dinosaurs are said to have converted wings and over time dinosaurs eventually became birds! What about insect wings? Evolutionists offer you "multiple choice" for the evolution of insect wings. When you're given multiple options it means they haven't agreed on a story yet. Take your pick, but take it on faith. It is also believed that small rodent-like mammals took to the skies as bats. But apart from faith bat evolution is a mystery. Now within most of these groups we can find different solutions. Insect flight has various solutions. In birds there is the traditional wing, and the highly specialized wing of the humming bird. JET PROPULTION: This involves specialized structures designed to move in aquatic environments by squirting out water. This is believed to have developed independently in squids, scallops, dragonfly larva and jellyfish. Sensory systems are designed to detect different elements of the environment and often do initial information processing before sending signals to the brain for further processing. Every sensory system involves not only the sensory organ itself, but the nerves that connect them with the brain, and the processing of the information in the brain that allows the organism to utilize the information. It is of no use to have an eye without a visual cortex that can process the information. The organ and the processor must therefore be designed together. The senses of sight, touch, hearing, smell, and taste are ones we are familiar with. But even bacteria have systems that allow them to "sense" and react to their environment. Some organisms such as the platypus sense electrical signals in other organisms. The non-directed emergence of sensory systems is incredible enough to imagine their evolution once without having to consider how many of the same features are said to have arisen multiple times by evolutionary fortune. EYES/SIGHT: Camera eyes occur in jellyfish, octopus, squids, snails and even in coral reef shrimp. Compound eyes are found in insects, crustaceans, annelid worms and in bivalve muscles. The Sand Lance (a fish) and the Chameleon have independent eye movements as well as other similarities in their eyes. SMELL: Land crabs have an olfactory system that is similar to insects. The coconut crab is an example of what is believed to be the convergent evolution of smell. ECHOLOCATION: Several organisms send out sounds and use the echoes to create a picture of the environment. This system is believed to have evolved multiple times. The microbat and toothed whale are two animals that use echolocation. DNA evidence causes evolutionists to believe that echolocation has arisen twice in microbats. It is also used to some extent in oilbirds, shrews and tenrecs. It is now known that Dolphins and bats both use the same molecule, prestin, as an essential part of the echolocation system. This is one of several discoveries where environmental pressures are believed to have directed mutations at the molecular level. BRAINS: Of course all these specialized sensory organs would be worthless without a brain. Believe it or not, some scientists believe that brain structures evolved more than once, up to five separate times. Which means the behavioral "software" that operates in them must have evolved multiple times as well. Incredulity (skepticism) about believing this could evolve has also developed multiple times. There are many convergent structures and strategies for getting, storing and eating food. Here are a few. Insectivorous Plants: Plants that eat insects are said to have arisen at least seven times. They use the insects for nutrition, but still use photosynthesis to produce energy. This ability allows them to grow in soil that lacks nutrients. Examples are the sundew, venus fly trap, cobra Lily, butterworts, bladderworts and brocchinia reducta. Specialized tongue for nectar feeding: This is believed to have evolved in insects, both in butterflies and moths. It is also believed to have evolved in the marsupial honey possum and again in two unrelated species of birds, the hummingbird and the sunbird. Plankton feeding filters are another novel idea that occurs more than once in whale sharks and of course, whales. Elongated Fingers use for bug extraction: Both the Aye-aye and Striped Possum (a marsupial) have an elongated finger that they use to extract insects from trees. One evolutionist said that the reason this similarity developed is because there were no woodpeckers in the same habitat. How the organisms DNA knew to modify the fingers and the behavior was not addressed. Combo: Fore claws and sticky tongues. This combination of structures is believed to have evolved at least eight separate times as a strategy for eating insects. They occur in the anteater, armadillo, pangolin, aardvark, echidna, numbat, aardwolf, and the fruitafossor(an extinct rodent like mammal). Slothbears developed the claws and a long snout but not the sticky tongue. Woodpeckers use their long sticky tongue for bug extraction, but their beak serves the purpose of the claw. Quite often evolutionists refer to attack or defense mechanisms as part of the "evolutionary arms race." They imagine creatures developing systems and techniques for predation, defense and evasion in response to environmental pressure imposed by other organisms doing the same thing. A real arms race involves intelligence and planning. The molecular code in an organism has no idea what it needs to set its sites on or protect itself from, so it is an odd "arms race" indeed. It's a race where faulty equipment is more likely to result from code changes, than the ingenious solutions life really exhibits. Spiny quills: Surprisingly the porcupine is believed to have evolved twice, once in the old world continents and again in the new world continents. Spiny quills can also be found in tenrecs and echidnas. Saber teeth: We are familiar with the saber tooth tiger, but the saber tooth is believed to have evolved in other extinct species including nimravidae (they look like cats, but they're not), thylacosmilus (a marsupial cat look-a-like), gorgonopsia (an extinct reptile), creodonts (extinct mammal cat look-a-likes). Spiked Tails: Both the ankylosaurs (dinosaur) and the glyptodont (mammal) stumbled upon spiked tails. Poison ingestion: Some organisms are either poisonous or bitter to the taste based on poisons that are part of their diet. Plain tiger butterflies and Monarchs use alkaloids that they ate during the larval stages to give them a bitter taste. Both the Neotropical poison dart frog and the Mantella frog are believed to have evolved the storage of chemical toxins in their skin from a diet of mites. As a bonus for predators the butterflies and frogs also have bright skin colors as a warning that they are not good to eat. Venomous sting: The art of injecting poison is believed to have shown up independently more than ten times. This feature can be found in centipedes, jellyfish, spiders, scorpions, cone shell, various snakes, stingrays, stonefish, the platypus, the nettle plant and various insects, including bees, wasps and ants. Prickers and thorns: These are believed to have evolved many separate times. The evolutionary story tells us they evolved to prevent herbivores from eating the plant. This has been scientifically confirmed because herbivores actually eat plants, thereby providing the plant the selection pressure needed to mutate defensive systems. The field of biomimetics has been studying complex structures in life, some of which will be looked at in this next section. Discovery of how these natural marvels work has already aided in many technological advances. Keep in mind these highly specialized and technical systems are believed to have evolved more than once. One additional thought; many of these types of systems would not be apparent in the fossil record. For instance bioluminescence or echolocation would not be captured during fossilization. How many more systems have there been that we may never know about? Dry Adhesive Microstructures: These structures that allow organisms to stick to most smooth surfaces and also detach from them when needed are believed to have evolved independently in geckos, anoles, skinks and many insects. Recently scientists, after many "mind hours" have discovered how to mimic these structures for use in human technologies. Photonic Crystals: Scientists thought they had invented these until they found them in butterflies, and again in peacocks, and in a beetle found in Brazil. Not only that, but scientists had struggled and failed to create the perfect crystal diamond shape only to find it in the beetle. Accidental perfection strikes again! Photonic crystals enhance the color of the wings and feathers of these animals. Antifreeze protein: Used to lower the freezing temperature of an organism for sub-zero survival. This is believed to have developed independently in fish at both the northern and southern arctic regions. Antifreeze proteins are also found in some plants and in some insects. There are many other animals that can survive sub-zero temperatures that utilize other strategies to outwit the cold. Silk production: Silk is a composite protein molecule that is stored as a liquid in glands and transformed into fiber through a complex process. Spiders can have several different glands designed to spin specialized silks. The ability to spin silk at will is believed to have evolved in spiders, moths, caddisflies and weaver ants. Bioluminescence: controlled, light producing, cold chemical reactions. Most of these are 90% efficient or better, meaning that almost all available energy is given off as light rather than heat. Bioluminescence is believed to have evolved in jellyfish, various species of deep sea fish, krill, octopus, several one celled organisms including halobacteria, some mushrooms, fireflies and glow worms, to name a few. Tails that can grab: New World monkeys, kinkajous, porcupines, tree-aneaters, marsupial opossums, the salamander (Bolitoglossa), pangolins, treerats, skinks and chameleons. Bird-like parts in dinosaurs that are believed to be convergent in birds. Hips: The ornithischian dinosaurs had hips like birds it is not believed to be an ancestor of birds. Birds supposedly came from another line of dinosaurs (saurischian) that started with lizard hips. Tibiotarsus bone: A group of dinosaurs (Heterodontosauridae) are not believed to be related to birds are believe to have developed a leg bone which is similar to one found in birds. There are many "pre-programmed" behaviors in organisms. Behavior must be coordinated with the organism's phenotype and also its environment. It does no good for a bear whose internal calendar tells it to hibernate in the summer or who has no desire to increase its body fat or whose body is not designed to tolerate long periods of inactivity. The solutions to all these problems are found in the genetic code of the organism. Its desires, its functions and many times its knowledge of the environment are encoded into its genes. Mathematics: Many organisms, believe it or not, have mathematics programmed into their behavior. The ability to count is believed to have evolved multiple times in the remote unobservable past. Dormancy (Hibernation): Each of these following is believed to have evolved unique ways of going into some period of hibernation: Bats, fat-tailed lemurs (store fat in their tails), ground squirrels, hedgehogs, poor-wills, swifts, bumble bees, earthworms, frogs and toads, most lizards, mud turtles, some snails, some snakes. While plants do not hibernate they also go though extensive planned dormant stages. Migration: The story of the evolution of migration is that it evolved in response to population pressure in some cases, in others to lack of food, in others for the need to mate, but simply put migration is said to have evolved to aid in survival. "The survival of the fittest." Why not say that in the first place, it's so much simpler. But in reality, migration was designed to solve some very specific problems. An organism needs some specific capabilities in order to be successful at migration. Many need to be able to store enough energy for the journey and know when enough has been stored. Many also need to be able to travel for long distances without stopping. All migratory animals have to have some idea where they are going, some even go to places they have never been before. Organisms that use the Earth's magnetic field to navigate include: Geese, Pigeons, mole rats, loggerhead turtles, whales and possibly sharks. Organisms that use the stars, sun or other landmarks to navigate: most migrating birds can use cues in the sky to navigate during the day or night. Sparrows are one example. How did the ability to use maps of the stars get imprinted on their DNA? Need for new food sources in anticipation that food at the new location will indeed be there: Wildebeests, zebra, lemmings and locusts. 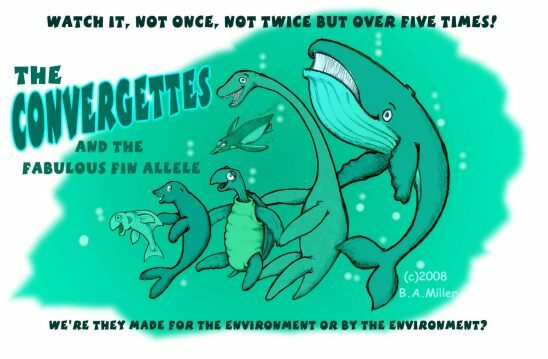 Migrating to specific places to have kids: Right Whales migrate from the Antarctic to Patagonia and the green turtle from the coast of Brazil to Ascension Island. Fish called Freshwater eels, because they look like eels and live part of their life in fresh water also migrate to the Sargasso Sea near Bermuda. There's convolution for you. Why are they called Freshwater eels if they're not totally fresh water and not eels? Salmon commit the smell of their birthplace to memory and can find it many years later when they return to the lake where they were born. Migration to warmer environments: Organisms that migrate for better living conditions include, sparrows, geese, elks, moose, antelopes and butterflies. Monarch butterflies follow a route to Mexico or California without having ever been there before. The butterflies that reach the wintering sites are actually two generations removed from the ones that left the previous spring. As discussed above, mimicry from an evolutionary standpoint is believed to be a form of co-evolution in which one organism benefits when its DNA accidentally converges on similar patterns and or structures of another organism and is seized on by the wise but blind creative force of natural selection. In reality however, natural selection explains why the mimic will continue to look like what it is mimicking since any deviations from that form will cause it to loose its selective advantage. The origins of the assumed genetic changes have yet to be properly examined. Planthopper is one of several insects that look like a leaf. Treehoppers are insects that look like thorns. Walking Sticks are insects that mimic the look of small tree branches. Moths: There are many types of moths that look like tree bark or dried leaves. Ophrys Insectifera is an orchid that mimics some insects so completely that the insects even try to mate with them. How much does it take to fool a fly? Color Changes to mimic background can be found in frogs, lizards, chameleons, flounders and the octopus described below. These represent cases of convergent co-evolution. The Mimic Octopus has the amazing ability to mimic the shape and color of several different poisonous fish including lion fish, sea snakes and soles (flatfish). Viceroy Butterflies mimic the Monarch. There are also several other types of butterflies that mimic each other. Owl Butterfly looks like it has an owl eye on its wing. Wasp Mimic: The ash borer moth mimics a paper wasp. Brookesia Superciliaris, a lizard that looks like a leaf and can change color to match its surroundings. Grasshopper from Borneo looks and acts like a tiger beetle. Elephant Hawk Moth Caterpillar changes to look like a snake when threatened. Photuris, this lightning bug is not related to fireflies, but are believed to have evolved a flash sequence that mimics their firefly prey. Cuckoos: The Cuckoo lays its egg in the nest of a host, removing one of the host's eggs. The cuckoo egg mimics the egg of the host in coloration and the host will raise it. Several spiders mimic ants either by looks and or by chemical deception.